It is a real delight to join you at tonight's concert. the fifth year of the partnership between Wuliangye and Philharmonia Orchestra. First, to seek harmony without uniformity. Wuliangye is one of the top ten liquor brands in China. Its fragrance comes from a special brewing process involving five choice grains including broomcorn, rice, glutinous rice, wheat and corn. Likewise, the beauty of symphony comes from a harmonious blend of tones and rhythms created by dozens of musical instruments. Therefore, beauty comes from harmony without uniformity. As a Chinese adage goes, "Wouldn't it be boring if one has to listen to one single musical instrument all the time!" China and the UK differ in social system, history, culture and development stage. But both have created time-honoured civilization and splendid culture. As the world is undergoing profound changes unseen in a century, it is all the more important that our two countries, as permanent members of the UN Security Council, work together to uphold the rule-based international system and build a community with a shared future for mankind featuring mutual respect and harmony without uniformity. The second message is to enhance exchanges and mutual learning. Exchanges between different civilizations lead to progress, so nations should learn from each other and learn to co-exist. In China, more and more people have come to know about Western symphony and fallen in love with it. Take for example Ms. Zhang Xian, our conductor tonight. She studied Western music in China before making it to the world stage. Most of other well-known Chinese musicians, such as Lang Lang, Li Yundi and Wang Yujia, also began their career as a performer of Western music in China. But in the West, there are not many people who know and love Chinese music, and even fewer who know and love Chinese liquor. You cannot order Chinese liquor in a British pub yet. So, the cooperation between Philharmonia Orchestra and Wuliangye is important: It brings Western music to the Chinese people, and it helps Western people learn more about the culture of Chinese liquor. Your cooperation opens a window for more and more people to experience the charm of the Chinese civilization. 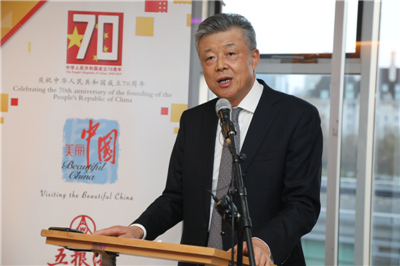 I hope this will in turn encourage mutual learning between China and the UK, and contribute to the enrichment of both our cultures. The third message is to promote win-win cooperation. I am glad to see that in recent years, Philharmonia Orchestra has incorporated more and more Chinese elements. It is the only British orchestra that has held concerts in celebration of the Chinese New Year for three years in a row. Last year, it went on a tour in China, where it received enthusiastic response from the Chinese audience. It has also worked with Xueersi Online School in China to launch an on-line music appreciation course. 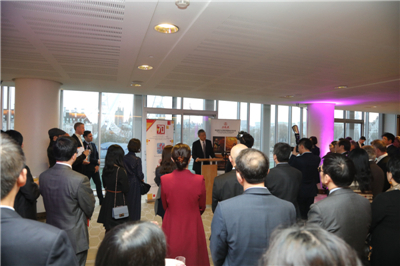 Wuliangye has hosted several tasting events in the UK. This has increased the visibility and popularity of the Chinese liquor here in this country. The partnership between Philharmonia Orchestra and Wuliangye, two famous brands, is the best exemplar of win-win cooperation. As China deepens reform and opens up wider in the years ahead, there will be more opportunities for the UK. Two immediate opportunities are the second Belt and Road Forum for International Cooperation and the second China International Import Expo. I hope that British friends from all walks of life will take an active part, seize the opportunities and join hands with China to achieve common development. The Chinese people believe that harmony arises from the ability to appreciate different cultures for their unique beauty. I hope that at the end of this beautiful evening of music and liquor, we will all have a better understanding of the importance of China-UK cultural and people-to-people exchanges. Let's join hands to make sure that the China-UK "Golden Era" go steady and go far! In conclusion, I wish this concert a great success. And wish you all a memorable evening!